Part 4. Invest to build a high performing healthcare marketing team. Final post in a four-part series. First, what businesses, clinical programs or market expansion initiatives offer the best opportunity for growth and profitability? Second, within priority programs and service lines, what strategies and tactical initiatives will best achieve marketing goals? The third decision point is: what infrastructure investments are required to optimize marketing performance and ROI? In other words, what capabilities, technologies, skill sets, business partners, processes and tools are necessary for the marketing team to effectively execute marketing strategy? Building a high-performing marketing team and the systems to support them are strategy-critical investments that will generate significant returns over the long term. Structure, staffing and skill set of the marketing team. Is the team optimally organized and staffed to execute and manage against strategic priorities? Do they possess the skills required in today’s complex and competitive world – including business analytics and strategic thinking skills? 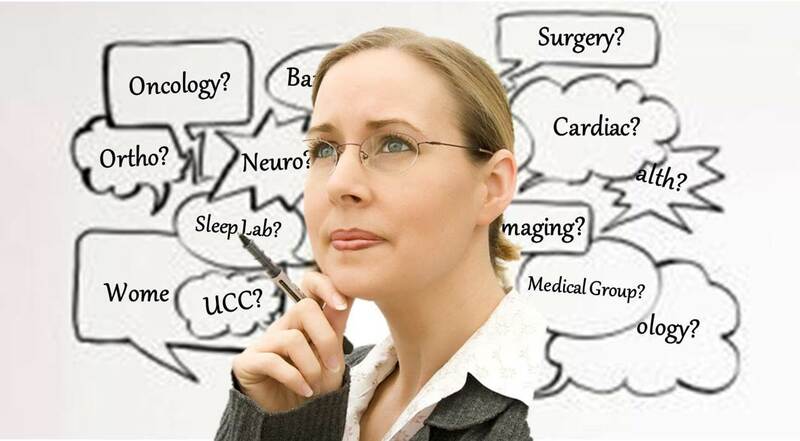 Can they mobilize and align clinical, administrative and other functions to execute marketing strategy? Are they fluent in digital media and skilled in web, social networking and mobile technology platforms? CRM and call centers. Next, evaluate the capabilities, systems and processes to capture and respond to customer inquiries (both consumer and physician), and to capture, analyze and manage customer level data. Today, marketers are moving toward integrated customer contact centers that better leverage call center, web inquiry and CRM capabilities in order to connect customers with services, capture data to improve marketing decision-making, and measure the effectiveness of marketing investments. Digital marketing capabilities and systems. One of the biggest challenges facing marketers today is the pace of change and shift in investments required to ramp up digital marketing. Web, search, social media and mobile marketing are no longer optional – nor should they be secondary priorities. There is no better time to stop funding tactics with marginal returns (among my favorites are billboards) and plow those dollars into the staffing, training and systems to become digital marketing experts. Decision support systems. The key question for marketers is “do we have the information needed to inform our decisions about strategy, investments and outcomes?” Competitive intelligence, market research, trended performance data (e.g. volume growth, revenue, margin, etc. ), market projections, industry trends, segmentation studies and other robust information sources are vital to effective marketing decision-making. Business partners and outsourced support. What to build in-house versus what to outsource is often a tough question. The rule of thumb is that if it’s not critical to core operations or a core competency in which you’re willing to invest and nurture, then outsourcing is probably the best alternative. Business or outsourced partners include advertising agencies, digital marketing firms, call center operations and research firms, among others. A periodic review of contract terms and performance is always a good idea. Shorten your “to do” list. Often, one of the more difficult tasks for marketers is to eliminate activities that do not contribute to growth and improved competitive performance. But in today’s environment, “squeaky wheels” must give way to an evidence-based approach to marketing investment. The key to success is focusing your time – and dollars – on fewer, more impactful activities. More than ever, chief marketing executives are being held to a higher standard of accountability for return on marketing investments. A disciplined approach to marketing resource allocation planning is required to understand what programs, services or segments will best drive growth and improve business performance, and what activities and support systems will contribute most to those initiatives. 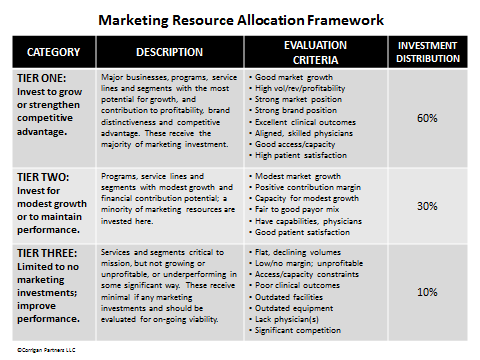 Both top-down and bottom-up approaches to marketing resource allocation planning are necessary; top down for strategic marketing planning across a health system’s portfolio of service lines and growth initiatives – and bottom up to develop specific marketing plans and budgets within each priority program. Most important, perhaps, is to use a data-informed approach to gain organizational commitment to stay on strategy. Part 1 – The secret to healthcare marketing ROI? Focus. Focus. Focus. Part 2 – Focus marketing investments to improve business performance. Part 3 – Let strategy drive healthcare marketing decisions. When it Comes to Service Line Marketing, it Takes a Village. Healthcare marketers know all too well that when someone from operations shows up to talk about marketing clinical service lines, they are usually asking for service line advertising. The narrow view of service line marketing as simply promotions sub-optimizes marketing performance and wastes money. Every marketer knows the agony of launching a promotions campaign only to learn that some aspect of access, capacity, physician loyalty, etc. is out of whack. A few years ago, I met with a hospital that had launched an aggressive advertising campaign for their orthopedic service line. As campaigns go, it was pretty effective in making the phone ring. The problem was the hospital’s physicians had excessive wait time for appointments. The one physician with capacity was taking procedures to another hospital. And no one thought to ask the OR about capacity. The surgical services director insisted that no additional time slots existed or could be made available for new volumes. Both service line administrators and marketing executives should expect more of their marketing investments. The bottom line is this: the purpose of marketing is profitable revenue generation. And this doesn’t happen through promotions alone. Especially when other parts of the marketing mix (e.g., access, capacity, customer experience, product design, clinical quality, pricing, physician relationships) operate outside the realm of the marketing department’s influence. Achieving service line growth targets, improving financial performance and increasing customer loyalty requires a purposeful, comprehensive and cross-functional approach to service line marketing. Where to start? Pull together a cross-functional strategy team that includes service line operations and marketing staff, along with representatives of other core clinical or business functions relevant to that service line, such as the emergency department, nursing, OR, diagnostic imaging, physician services, managed care contracting, IT, or supply chain. Develop a strategic marketing plan that addresses all aspects of the marketing mix. With a comprehensive and focused strategy in place, marketing tactics and investments – including promotions – will be much better aligned to achieve its objectives. Do we understand the unique, competitive position we currently hold or desire to hold for this service line and how to strengthen points of differentiation? Have we quantified the opportunity for volume and revenue growth, and do we have the appropriate mix, number of and relationships with physician specialists to achieve our volume goals? Have we identified other key referral and access points for this service line and do we have the means and capacity to generate volume through those channels (e.g., emergency department, urgent care, employer sites, on-line appointment scheduling, etc.)? Do we know which population/disease/needs-based segments offer the highest potential for profitable growth for this service line, and does our plan address both the clinical programming and promotions strategies needed to attract and serve those segments? Do we have strategies and tactics in place to optimize our position with employers and improve contracting leverage with commercial payors? Are screening, education and outreach events targeting at risk populations, and do we have mechanisms in place to connect high risk participants with providers and services? Are promotional strategies and tactics (e.g., sales, events, advertising, digital and social media, etc.) designed to strengthen the service line brand, stimulate demand and influence consumers to take action? Are we optimized for search? Are marketing resources and investments prioritized to strategies that have the greatest potential to impact volume and financial goals, and what non-revenue generating activities need to be discontinued, minimized or re-assigned? Do we have the marketing management capabilities and systems (e.g., structure, skills and tools such as call centers, CRM/PRM, appointment scheduling, etc.) to drive customer acquisition and retention by generating demand, capturing and converting referrals into appointments and procedures? Is operations a willing partner in the growth agenda, and do our operating processes, procedures, and systems support patient acquisition and retention; e.g., customer service orientation, timely and convenient appointments, care coordination, quality and safety outcomes, patient satisfaction, etc.? Have we identified core marketing performance metrics, and put in place methods to monitor, track and report outcomes? 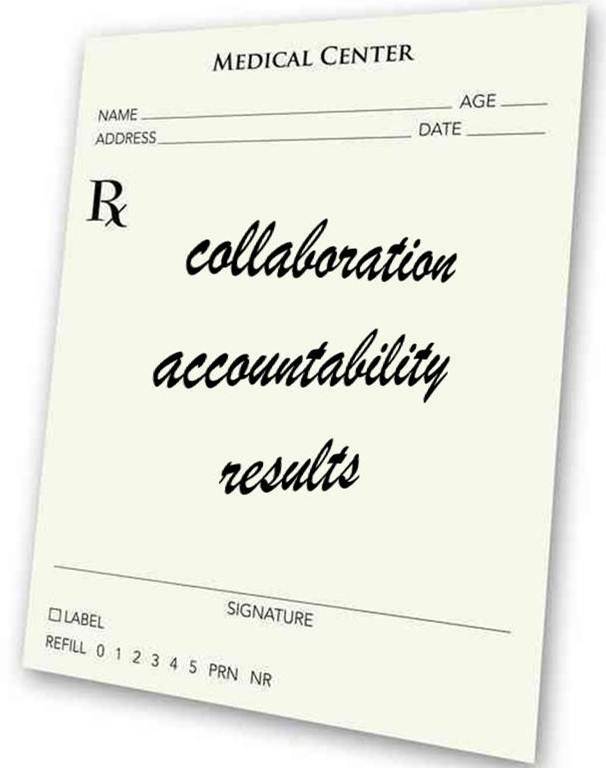 How will we communicate the plan to key internal constituents, gain agreement for the focus and investments, and create co-accountability (marketing, clinical, administrative) for results? When operations and marketing plan together and share accountability for delivering on revenue and profit targets, marketing magic can happen. It takes a marketing village, not just the marketing department, to generate success. I had a chance to talk with Bill Moschella Co-founder & CEO of eVariant about the future of healthcare marketing at the SHSMD conference this past September. Here’s that interview. What advice do you have for marketers seeking to improve marketing performance and build future ready marketing operations? Growing new and returning patient revenue. Optimizing resource utilization, including physician alignment. Developing strategies to build collaboration among multiple service lines. Streamlining operations by creating a common view that focuses the enterprise. Tracking revenue and cost performance of individual service lines and individual physicians. The Strategic Halo Effect also addresses the essential question: how to thrive in this new era of healthcare reform? Follow the link below to learn more about this complementary webinar. The Strategic Halo Effect: the Science of Improving CV Service Line Volumes, Revenue and Operations; Thursday, October 20, 10 AM Pacific, 12 Noon Central, 1 PM Eastern.